In today’s zero-waste economy, end-of-lifevehicles (ELVs) have a better place to go to than landfills or so-called “graveyards” for used vehicles, says Angelica Buan in this report. Plastics have come a long way as an automotive material of choice. Until the 1970s, plastics were regarded as a non-engineering material and therefore not suitable for vehicle parts that need the robustness of metal or aluminium, due to its poor strength-to-density ratio. Advancements in technology have since then transformed the properties of plastic to make it on par with if not even succeeding the capabilities of materials like steel. Advance plastics are non-corrosive, with heat and temperature resistance. Even more so, with the increasing requirement for reduced vehicle weights, lower vehicle emissions, and increasing safety, plastic has become a material of choice. Plastic parts used in the automotive industry, such as dashboards, bumpers, handles, clamps and others, are mostly injection moulded, such as in the fuel systems, door systems, seating and others. Today’s vehicles are made up of as much as 50% of plastics, and is projected to reach up to 75% by 2020, according to IHS Automotive , but only contribute to about 10% of a vehicle’s weight. Amid these developments in plastics, recovery of these materials from end of life vehicles (ELV) is both a challenge and potential for material sourcing to the industry, given the thrust now for a zerowaste economy. Plastic is a valuable resource, an oft-said motto in the plastics industry, and ergo, plastic material recovery is a serious topic. Disposal of ELVs is covered by agency directives or country-specific regulations. In the European Union (EU), for example, waste generated from ELVs is between 7 to 8 million tonnes. The EU’s ELV directive 2000/53/EC sets targets for reuse, recycling and recovery of vehicle components. Manufacturers are also urged to ensure that vehicles are designed and manufactured in such a way as to achieve the set targets. Materials that go into the design of vehicles are also being assessed, such as PVC. Additionally, recycling of all plastics from ELVs should be continuously improved, as stated in the directive. In the US, a recent initiative on automotive parts recycling has been launched by the Plastics Industry Trade Association (SPI), an organisation representing nearly 1 million workers in the US$427 billion US plastics industry. The Automotive End of Life Vehicles Recycling Demonstration Project will develop a method of collection and recovery of PP and thermoplastic olefin (TPO) automotive parts in a way that demonstrates technical and economic feasibility. Organisations partnering with SPI in this project include the Automotive Recyclers Association (ARA), Automotive Recyclers of Canada (ARC), Canadian Plastics Industry Association (CPIA), and a number of independent plastics and automotive recyclers. 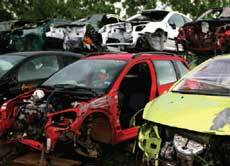 SPI says that approximately 12 to 15 million vehicles are scrapped each year in the US. Recovery of plastic components before shredding is largely driven by the resale market, but some recovery for mechanical recycling is also occurring. SPI’s project will also test how the increased automotive parts recycling can benefit manufacturers and the plastics industry. Therefore, for members to see the benefits, concrete data that builds the business case for these recovery models needs to be established, “to get real buy-ins”, says Kim Holmes, Senior Director of Recycling & Diversion at SPI. Data gathered and analysed (including that pertaining to design guide to optimise recycling opportunities) will be disseminated across the automotive and plastic recycling industries to predict trends in demand for recycled materials, “so recyclers can invest in processing capacity with greater confidence,” SPI stated. In Asia, India, whose consumer base for vehicles is rapidly growing, has likewise hashed an initiative to recycle ELVs through policies that it hopes to align to its goal of becoming one of the world’s largest recycling base for cars. India’s car sales are expected to shoot up to nearly 11 million units by 2020. The increase in car production also translates to an increase in the number of ELVs. Millions of vehicles that are above 15 years old are candidates for recycling. Hence, proper management for retiring of scrapped cars is being addressed. The Indian government reportedly has laid out a strategy to boost automotive recycling rates by giving consumers monetary incentives of US$375 for every passenger vehicle scrapped. Moreover, it has set up recycling units that will provide a more advanced and presumably cleaner recycling option to services offered by small units in the informal sector. By 2020, the government is targeting to recover 75,000 tonnes each of plastic and rubber as well as 1.5 million tonnes of steel scrap and 180,000 tonnes of aluminium scrap from ELVs. In 2011, a vehicle dismantling facility, also doubling as a recycling demonstration unit, was set up on the Global Automotive Research Centre (GARC) campus in Oragadam Sipcot Industrial Area in Chennai. The 138-ha facility was set up in cooperation with the Society of Indian Automobile Manufacturers (SIAM) and the National Automotive Testing and Research and Development Infrastructure Project (NATRIP). In August this year, a joint venture between Mahindra Intertrade, a part of Mahindra Group that owns and operates the country’s largest network of steel service centres in the automotive, power and home appliances sectors, and the stateowned MSTC, which acts as a regulating authority for export of ferrous scrap, was undertaken. It intends to build an expansive, first-of-its-kind greenfield automotive shredding and recycling facility to commence full operations by early 2018. The states of Gujarat and Maharashtra are being considered as the possible sites for said facility, which will establish an Integrated Automotive Recycling capability for ELVs, from collection, compaction, transportation and depollution to dismantling, shredding, recycling, and disposal. 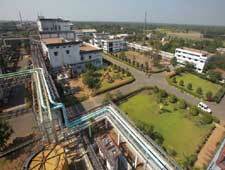 The joint venture also aims to fully recycle all materials. According to the proponents, the facility will be equipped with state-of-the-art, high-tech shredding and sorting equipment to meet global standards in recycling, and to tap into a potentially growing automotive recycling market projected by Mahindra to reach US$4-5 billion within the next ten years. Pitching into the recycling efforts are automotive makers that have implemented technological ways to easily recover plastics from recycled parts. For example, Japanese car maker Nissan employs a design strategy to ensure recycling and recovery of ELV materials. Its design guidelines ensure recoverability rate, dismantling efficiency, plastic part marking, and reduction of environment-impacting substances. In specific, the company also employs a device that pulverises bumpers from discarded cars, collected by its dealers. The bumpers’ coatings are stripped off without the use of chemicals. These recycled bumper materials are applied in both bumpers for repairs and bumpers for new vehicles, Nissan says. Moreover, Nissan technologically obtains PET regrind from recycled plastic bottles and uses them as main components in sound insulation layers in the dashboard and floor insulators. The PP bottle caps are recycled and incorporated into different automotive parts also. 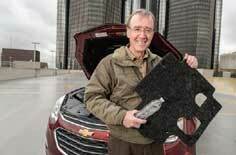 US car maker General Motors (GM) also recycles PET bottles and uses the regrind for noise-reducing fabric insulation that covers the Chevrolet Equinox engine. The company has been incorporating recycled content in a number of its vehicles. By design, GM vehicles are approximately 85% recyclable by weight, the automotive maker says, adding that it works with the vehicle dismantling industry to ensure the vast majority of material in its vehicle line are recoverable, recyclable or reusable in new vehicles or other consumer products at the end of life. American car manufacturer, Ford, on the other hand, has broken all rules in reusing and sourcing materials for its vehicles. It has utilised aluminium scraps, recycled plastic bags, bottles and carpets; and even soybean, coconut fibre and tomato fibre as a bioplastic material. This year, Ford announced that it is harnessing carbon emissions from factories and turning it into feedstock to make foams and plastic components for seats, engine parts, and interiors of its future cars. Ford is collaborating with Novomer, a Massachusettsheadquartered chemistry technology development firm, and other partners to develop the foam and other polymers, formulated from CO2-based polyols. The material is currently undergoing testing and is expected to debut in car seat cushions and engine parts of vehicles Ford is producing within the next five years. While the market for automotive parts recycling is in the nascent stage, the potential for growth is predictive. Yet, automotive parts recycling is constrained by economic and technology challenges. The scraps, which are heterogeneous and are commonly made of complex materials like reinforced plastics or those containing fillers; or plastic blends, such as EPDM or TPE; or the multi-component injection moulded parts, to cite a few, involve various considerations when recycling. Relevant processes are required for removal of odours and contaminants as well as to produce high quality regrind material that is suitable for reuse. The lack of market for plastic recyclates, as well as cost efficient recovery infrastructures or processes are significant challenges, according to a 2014 paper, Challenges and Alternatives to Plastics Recycling in the Automotive Sector. It also cited the “knowledge gap between manufacturers, consumers, and end of life facility operators,” as reasons for end of life plastics not being fully recovered or at worse, just ending up in landfills. Nevertheless, as efforts to adopt a zero-waste economy across industries are gaining momentum, these challenges, in no time, shall be overcome.